Rated M for Mature. 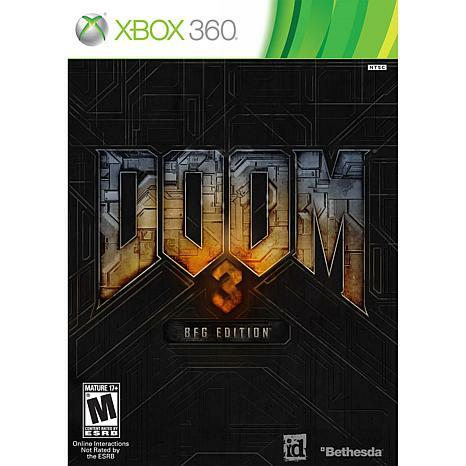 DOOM 3 BFG Edition features DOOM 3 and the Resurrection of Evil add-on pack, both of which have been completely re-mastered. The package also includes hours of new content -- seven new levels entitled The Lost Mission. This genre defining game and its expansion pack offers greatly enhanced graphics, deeply immersing the player in the demonic world of this terrifying horror masterpiece. Players will also experience a never-before-seen single-player story, The Lost Mission, featuring seven heart-pounding levels that will once again have them on the edge of their seats. DOOM 3, Resurrection of Evil, and The Lost Mission have been optimized in 3D, featuring 5.1 surround sound, improved rendering and lighting, and a new check point save system allowing for smoother progression through the game. id Software has fine-tuned the controls to bring the intensity of the DOOM single and multiplayer experience to the consoles, and DOOM 3 now features the new armor-mounted flashlight, allowing players to illuminate dark corners and blast enemies at the same time. As a special bonus, DOOM 3 BFG Edition will also include the original DOOM and DOOM 2 games, making it the definitive collection of the revolutionary games developed by id Software. A COLLECTION EDITION The BFG Edition includes remastered versions of the 2004 first-person shooter, its 2005 expansion Resurrection of Evil, and The Lost Mission, a new seven-mission pack. It also contains the original Doom and Doom II games, frequently cited as progenitors of the FPS genre. ENHANCED CHANGES Doom 3 and its expansion will receive a high-definition face-lift with new lighting and rendering as well as stereoscopic 3D support, 5.1 surround sound, and achievements and trophies for their respective consoles. A NEW CHECKPOINT SYSTEM AND AN ARMOR-MOUNTED FLASHLIGHT The gameplay will also receive changes in the form of a new checkpoint system and an armor-mounted flashlight, allowing players to operate weaponry while simultaneously illuminating Doom 3's darkened environments. The previous version required players to shift back and forth between the handheld flashlight's visual awareness and the much heftier firepower of Doom's diverse arsenal--inspiring a duct tape mod to give players the best of both worlds. 17 and Older. Fighting and Shooting. BETHESDA. USA.